Got some insider info that your favorite band will be jamming at Banding Together ’12? (Don’t worry if you’re currently not in the know, we’ll be posting the full line-up soon once it’s official) Want to show your love for the band with a member of your firm, your colleagues or relatives or neighbors, or you just are a fan of their music? Advanced voting for your favorite Banding Together ’12 band is now open on this very website. Online voting is super quick and easy. Just go back to our home page, click on “online contribution” in the box on the upper right hand side of page, and donate via credit card by “Designating” “Banding Together ‘12” and “Dedicating” to “Votes for [Insert Name of Band].” It’s $1 per vote, so as we say here at Gifts for the Homeless, vote early and often! Advanced votes will count on the night of the concert to determine which band wins the competition for 2012. All funds from votes are used by GFTH to purchase and distribute essential new clothing items for the DC-area homeless, so your votes will go far to help your band win and to clothe those in need. Banding Together 2012 Poster, Help Us Spread The Word! 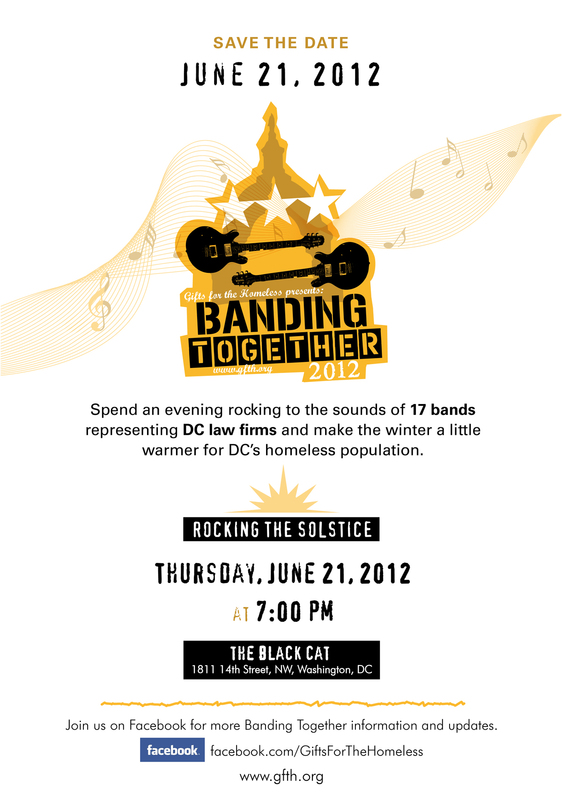 Charged up and ready to ready to spread the word about Banding Together ’12 on 6/21/2012 at the Black Cat? Here’s a nifty flyer to print out and post around your office and elsewhere; email to the boss, the office recruiter, colleagues, friends and family; and post on your social media. 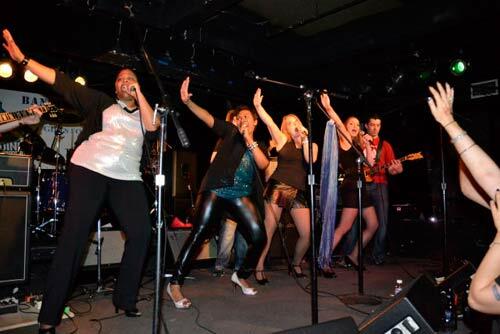 Join GFTH on June 21st to Rock the Summer Solstice for Banding Together/Battle of the Law Firms 2012! 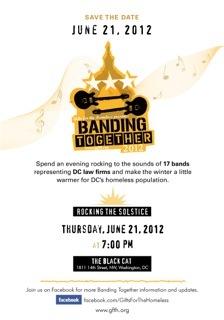 On the night of the summer solstice, June 21st, starting at 7:00 p.m., Gifts for the Homeless (GFTH) will present 17 awesome bands from DC law firms that will battle it out at the Black Cat music venue for the Ninth Annual Banding Together: Battle of the Law Firm Bands. 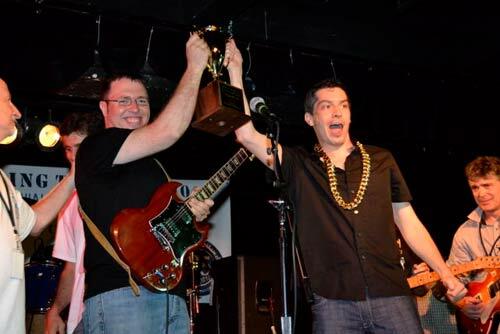 Each band will have the opportunity to collect votes – $1 for every vote – to win the Banding Together ’12 Championship Trophy. Last year’s championship trophy went to the Sutherland Comfort band. Watch video. Each vote, or donation, enables GFTH to purchase thousands of clothing items for the homeless in the DC metropolitan area. In 2011, Banding Together raised $150,000 – providing more than $1 million (retail value) in essential new warm winter clothing to area homeless. Banding Together ’12 Sponsorships are Now Available! Law firms, vendors, corporations and companies, universities, non-profits, individuals and all others are welcome to sponsor our event. Sponsorships are available from $250 to $15,000, and come with free tickets to the event; recognition in GFTH’s promo materials, event posters, and thank yous; GFTH websites and social media; and good karma (GFTH uses 100% of all sponsorship funds to purchase essential new clothing for the area homeless). Sponsorships are also tax deductible. Contact Nancy Johnson (njohnson@kirkland.com) or Laurie Glassman (lglassman@whitecase.com) to become a sponsor of this amazing event for a great cause that is attended by over a thousand people in the DC legal community.